Easter is on the horizon, and I've been celebrating early by eating chocolate bunnies and buying jellybeans in bulk. I think spring-themed candy just the prettiest. I'm tempted to string a few speckled malted milk eggs on ribbon and wear them as jewelry. This piñata is my way of celebrating the vibrant candy of the season. In fact, it's a giant piece of candy itself! I made it using vanilla royal icing and edible wafer paper. 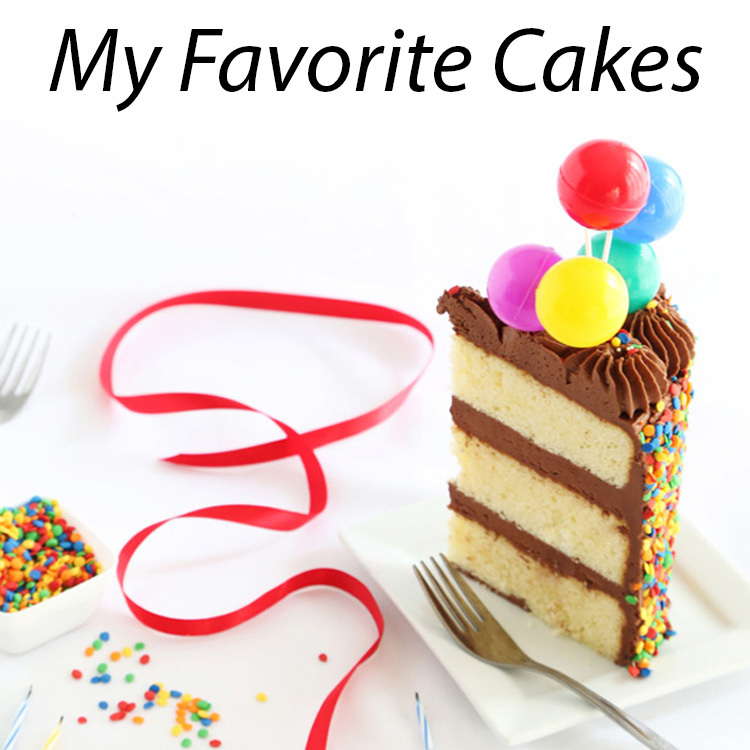 It's pretty easy to make (albeit a tad messy) and a fun interactive centerpiece. There is much amusement to be had with cracking a giant egg. You can tap one side on a counter top to make a weak spot in the shell, and then pull off (and eat!) 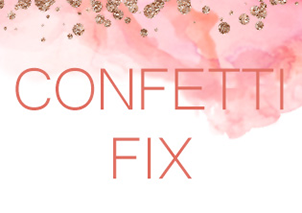 the pieces that break away (cue the Willy Wonka music Pure Imagination!). I would advise cracking the egg on a table top surface instead of a corner, or else you may end up redecorating your floor Jelly Belly style. If you'd like a neater opening, then you can cut out a hole in the shell with a serrated knife. I put together a picture tutorial of the egg-creation process, so you can follow along if you are inspired to make your own. You'll need sheets of wafer paper cut into strips and prepared stiff peak royal icing. I used 12-inch balloons to make an egg shape, and only inflated them a little over halfway full. The balloons are coated with vegetable shortening, and the excess is blotted away with a paper towel. A small pot or cake pan makes a good balloon holder and will make it easier to reposition the 'egg' as you work. 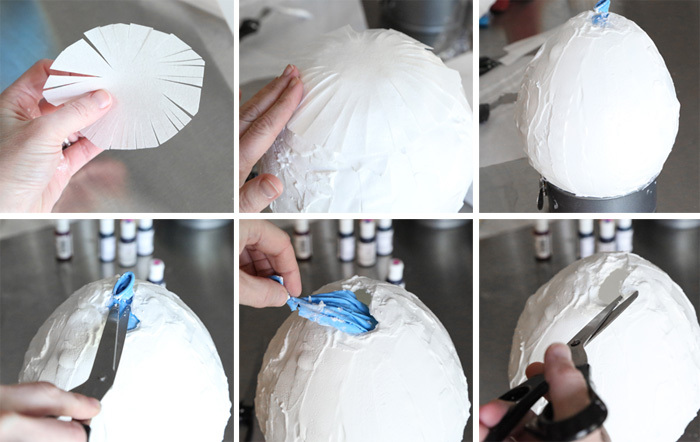 Here's the gist of the 'paper mâché' technique: Cover a portion of the balloon in royal icing and add a wafer paper strip on top; frost the paper. 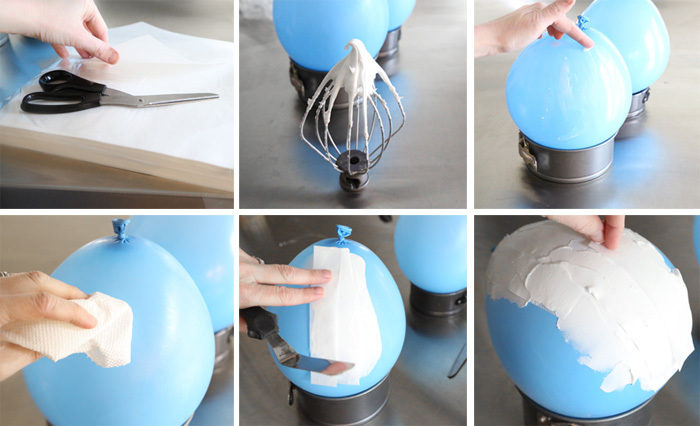 Continue working your way around the balloon with icing and wafer paper strips. The bottom of the balloon needs to be reinforced since the candy sits there when the egg is filled. I did this by cutting three wafer paper circles and fringing the edges. These pieces sit on the bottom of the balloon and the fringe is smoothed down onto the royal icing. The balloon doesn't have to look perfect, so don't worry about making it beautiful at this stage. The surface will be covered with more wafer paper later. Let the covered balloon dry overnight. The next morning, make sure the outside is firm by tapping it with a finger all around the surface. If it's firm and hollow-sounding, the balloon can be deflated and pulled out of the egg. The inside of the egg will still be a little moist, so let it dry for two or three more hours before decorating and filling. Using a pair of kitchen dedicated scissors, trim the hole at the top of the egg large enough to receive candy eggs and jellybeans. Cut more wafer paper into strips, and then fringe the strips. Using corn syrup and an artists' brush, paint a line of syrup at the top edge of a fringe piece and adhere it to the egg. Repeat until the entire egg is covered. I used a few circles made of fondant to decorate my egg. They were glued on with corn syrup. When you're all finished, fill the egg with candy! Remember the wafer paper circle that we fringed to reinforce the bottom of the egg? You'll make two more of those to close the top of the egg. Just paint a little corn syrup around the top edge of the hole and stick them on. It's been fun to have this guy sitting on our kitchen island, where we can nibble candy as we please. With its fringed decor, it struck me as part piñata and part furry Muppet. It has a personality of its own - so much that it startled me when I went downstairs for a midnight glass of water! I know 'Edible Paper Mâché' doesn't sound appetizing, but I tell ya - It's not bad! And I have a feeling that kids will LOVE IT. I'm such a huge nerd for crafty sweets. 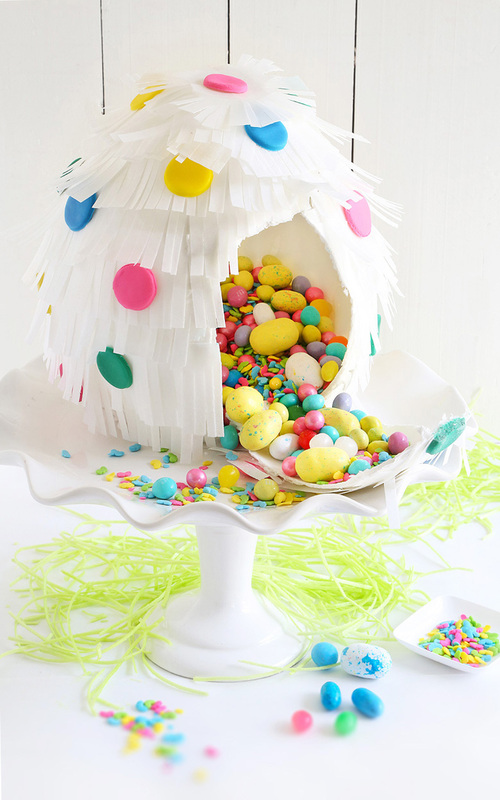 If you have a heart for them too, then you'll have lots of fun making this piñata Easter egg. Prepare the balloon: Inflate the balloon to about 8-inches tall. Place the balloon sitting upright in a small cake pan or sauce pot. Cover the entire balloon with vegetable shortening and wipe away the excess with paper towels. You only want a thin trace of the vegetable shortening to remain. 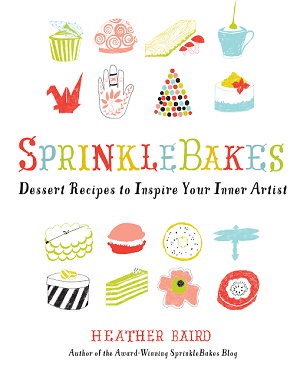 Prepare the royal icing: Combine the meringue powder and water in a standing mixer fitted with the whisk attachment. Whip until thick and opaque. Add the confectioners’ sugar and whip until stiff peaks form. The icing should be thick. 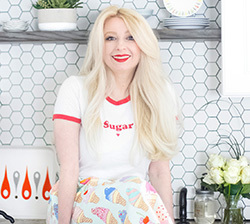 Place a damp tea towel on top of the bowl of icing to prevent it from drying out as you work. Paper mâché technique: Using an offset spatula, cover one side of the balloon with royal icing. Cover the icing with wafer paper strips in a single layer horizontally; cover the strips with another layer of icing. Some of the strips may want to pops up or buckle – just keep smoothing them down with the spatula. 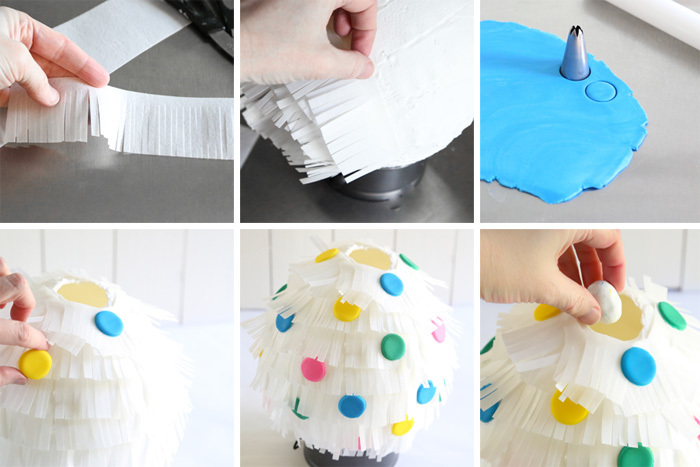 Turn the balloon and repeat until the sides of the balloon are covered in edible paper mâché. Cut three large circles of wafer paper and fringe the edges (see picture tutorial for visual). Turn the balloon on its side and frost the bottom of the balloon. Center the wafer paper circle on the bottom of the balloon and smooth down the edges; frost the wafer paper. Repeat this twice more with the remaining fringed wafer paper circles. Turn the balloon upright. Frost any exposed wafer paper and reinforce bare spots with pieces of wafer paper and icing. Don’t worry too much about making the egg look perfect at this point, its lumps and bumps will be covered with more wafer paper. Let dry overnight. The next morning tap the egg to test its firmness. If it feels dry to the touch, then it’s time to remove the balloon. Hold the knotted end of the balloon and gently cut a hole in the neck with scissors. Hold the balloon firmly as the air deflates. Pull the balloon out and discard it. The interior of the egg will still be slightly moist, so let it dry for a couple more hours before decorating it. Paper fringe technique: Stack three sheets of wafer paper and cut them into strips; fringe the strips. Repeat this process as you need more fringe to cover the egg. Using a small amount of corn syrup and an artists' brush, paint a line of syrup at the top edge of a fringe piece and adhere it to the egg. Repeat until the entire egg is covered. You may need to cut some of the fringe strips to cover smaller areas, like at the top point of the egg and the round bottom. Let the fringed egg stand until the wafer paper is well set, about 1 hour. Cut circles from fondant using a small icing tip, a bottle cap or a small round cookie cutter. Dot the backs of the circles with corn syrup and place them on the egg; hold for a few seconds to ensure the circles will stick. 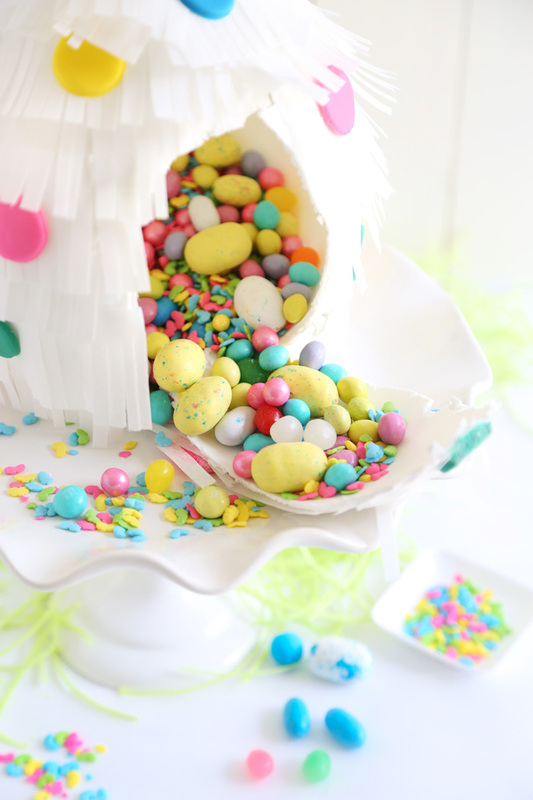 Fill the egg with candy at the top opening – I used Jelly Belly jellybeans, regular jellybeans, all sizes of speckled malted milk eggs and spring confetti sprinkles. Cut two round wafer paper circles and fringe the edges with scissors. Paint a little corn syrup around the top edge of the hole and center one circle over top. Press to adhere. Add a dot of corn syrup in the center of the circle and add the second fringed circle. Let stand until completely dry, one to two hours. Note: People with allergies to latex should choose a different project to make for Easter, unless a suitable replacement for the latex balloon can be found. 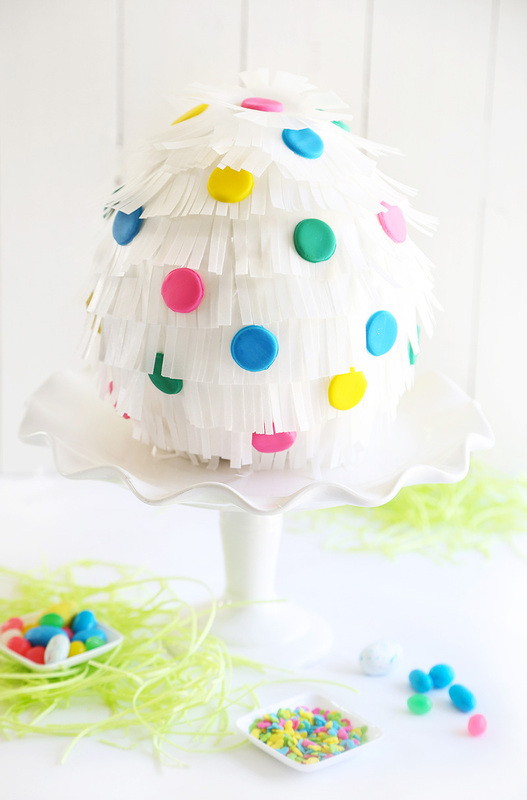 I’ve seen non-latex vinyl balloons online but have no experience with using them for edible piñata-making. Rhooooo! how amazing is that! Everyone will be in awe! 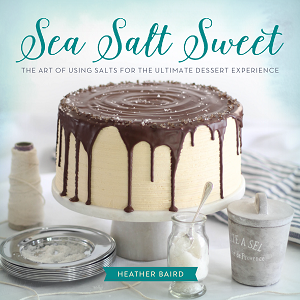 Bravo Heather! Incredible creativity as always! Kucing took one of my words..extremely creative and cute..amazing..
LOVE IT. Freeeeking Aah-mazing. Plan on using this for gift baskets. Thanks for sharing. Edible paper mache is such a brilliant idea! I'm so going to have to try this. It's the cutest! LOVE your jewelry idea. I would wear candy any day! This is seriously gorgeous. LOVE it! Wow, this is one of the most clever edible crafts I have ever seen. It's truly amazing! 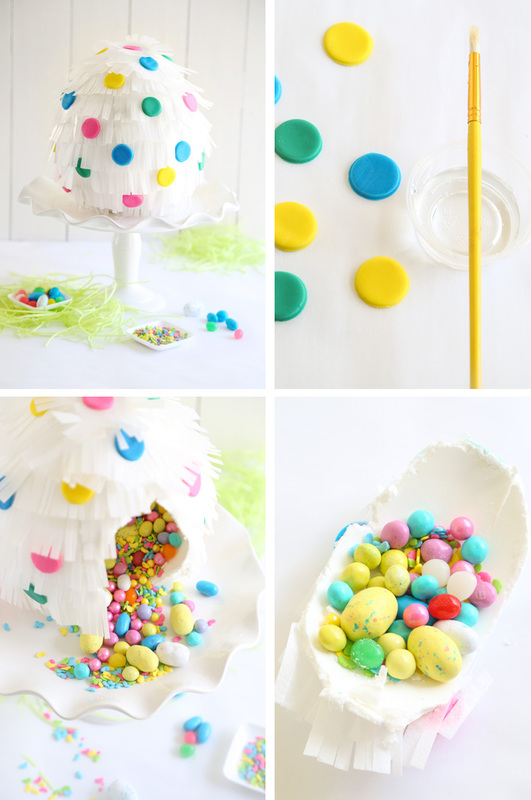 I will be showing my mom this post...so cool..edible paper mache...!!! Wowza!!! You are such a sugar wizard. This is genius!! Are. You. Kidding. Me?! This is fantatic! YOU are Willy Wonka!